Bruce removed the front left lower mudhole door, which has never been a brilliant fit. It has always needed a lead gasket to seal it. From the old gasket, you could see where the fit was not good. Carpo was going to have a go at gently improving the fit. Of course, we have no idea if these were the original doors, nor if they were in their original holes! After playing with that, Bruce decided that the drain pipe from the gauge glass was not passing through its slot in the cab floor. It was running down between the floor and the back of the backhead cladding. 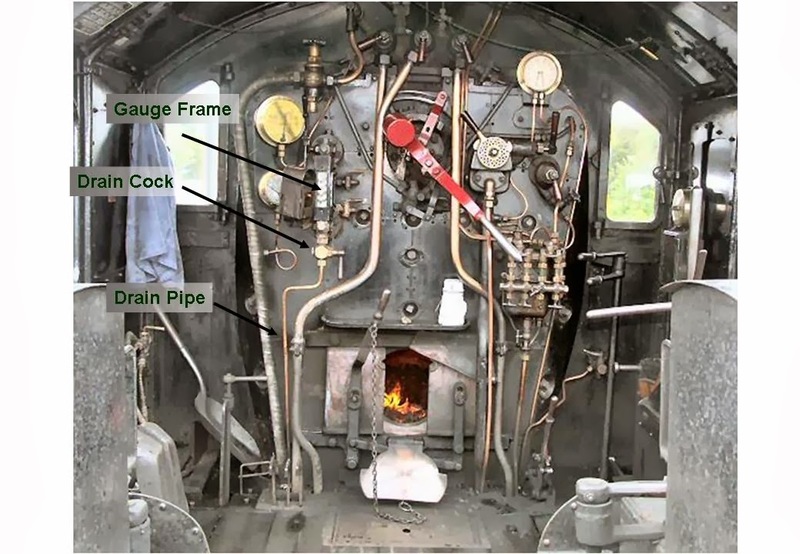 When the boiler is at full pressure, the expansion of the steel moves the firebox some 3/4" backwards into the cab. As a result, the drain pipe could be crushed between backhead and cab floor. 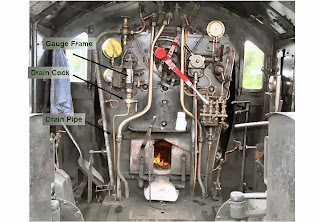 Bruce and Brian helped JC to shunt the loco round to "The parlour road" to get the boiler filled with treated water so that Carpo can see about a steam test on Wednesday (16th). The loco was then shunted onto the ash pit so that the redundant operating shaft for the ash-doors could be removed. Much to John's dismay, this was not an instant job as somebody had fixed an empty metal box over the top of some of the fixing bolts. Despite this the gang persevered, they removed the box, and then the support plates. After re-fixing the bolts in the brake shaft bearing brackets, the ATC box was re-instated and the loco was fit to be moved again. So JC promptly shunted it back to the apron outside the shed. John Tyler spent a large chunk of the day removing grot and rust from the stock of rail chairs, he then made up for that by applying paint to a number of part-finished ones, and finished his day by carrying out a stock check on the railway wagon models. Gilbert carried out a check on the available materials for bearing bushes to suit the new valve spindles. 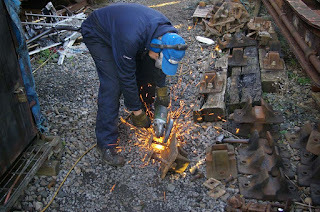 Bruce found a couple of old bushes which are capable of being re-worked to suit the new spindles, Arrangements have been made with Rod for this work to be done in the GWR Machine Shop. Gilbert will order new material for the remaining outstanding items.